When organizing your home, you want it to look neat, but you also want it to look nice. There are so many options out there that are well designed and fit into almost any home décor. As you'll find out with these home organization ideas, there is something to fit any taste. 1. Baskets are always a popular item for home storage organization. If they are wood baskets, they give a nice natural look to the room. They are handy for holding all kinds of things, from makeup to toys. 2. Shoe organizers are something no family should be without. Who doesn't get tired of either tripping over shoes as they come in the house or not being able to find the mate to the kids' shoes as you are getting ready to head out the door? There are different styles available, from shoe racks that fit in the bottom of a closet to those that hang on the back of a door. 3. Closet organizers are becoming big business; as a matter of fact there are companies dedicated to helping you design the perfect closet organizer for your home. They can be as simple as plastic or metal adjustable shelves, or beautiful wood cabinets that are built to fit in your closet. They can have shelves, drawers, and places to hang clothes and baskets. 4. Desk organizers are a must-have for any home office or homework area. In addition to the standard pencil can and paper clip holders, there are nice wood pieces that are great for sorting mail and important papers. A classic desk blotter and penholder will add a touch of class to any desk. 5. Clothes trees can add an old-fashioned flair to any room. There are also more modern designs to choose from. They can be used near an entry for guests' coats, or in the bedrooms as a great place for kids to put their PJ's, robes, or even a towel after a bath. 6. Furniture with drawers can be great in homes with limited space. There are couches and beds that have drawers built into the bases that make great places to store out of season clothes or toys. There are also coffee tables that come with built in storage. 7. Video and audio storage are often wonderfully crafted pieces of furniture. 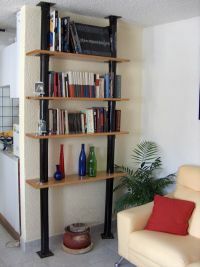 They can be incorporated into a media center in the home, or used as stand-alone pieces. Some of them are designed to look like antique pieces of furniture. 8. Jewelry boxes are a wonderful way to not only organize all your precious pieces, but many are almost as beautiful to look at as your jewelry. You can find hand-carved pieces, or boxes with inlay. These home decor items look great on a dresser. 9. Carts with wheels are a handy form of home organization storage, as they can be used anywhere in the house. Plus, if you don't need it all the time, they can be tucked away in a closet, pantry or corner. They can have drawers or shelves and offer additional workspace. They are great for kitchens. 10. Caddies are great for things that may need to travel from room to room. They can be nice looking buckets or baskets. There are also fabric caddies that have pockets that can be hung on the wall. These can be found in a wide variety of styles. They are great in kids' rooms for storing small treasures. No matter what your taste is in decorating, it's pretty easy to find great home décor accents to your home that add not only to the form, but to the function of your life. Return from Home Organization Ideas to Home Organize It!